Over the summer, while I was talking a break from the Goat & Lulu Etsy shop, I did a lot of sewing for myself. When I am caught up in orders, and making things for the kids, it is nearly impossible to carve out two hours or so to make a dress for myself (I still have a tunic that I cut out summer of 2014 that is waiting to be sewn together!)! But while I wasn’t taking orders, I used my free time to finally get some things made for myself. And it was GLORIOUS! I learned so much, and so tried many new techniques, and got over my lack of confidence in my ability to sew women’s clothes (they are unnecessarily intimidating sometimes!). I decided that I wanted to try to supplement my fall wardrobe with several (16, to be exact!) handmade items that would definitely elevate the distinctiveness and originality in my closet. I am obsessed with this coat! I even mentioned it in my Fall Must Haves a few weeks ago. I want to make mine very similar to the one shown above on the right, hooded and mid-thigh length, in a plaid flannel. I love how simple this jacket is, and am thinking of making it in a striped floral? Or polka dot? I don’t want a neutral piece, I want a statement piece in this jacket! Something that I can throw over a basic tee or chambray button up to instantly take the outfit from basic to special. I love a good cardigan. To wear around the house on the weekends, or throw over a dress when it’s a little chilly, or to keep in the car, just in case. 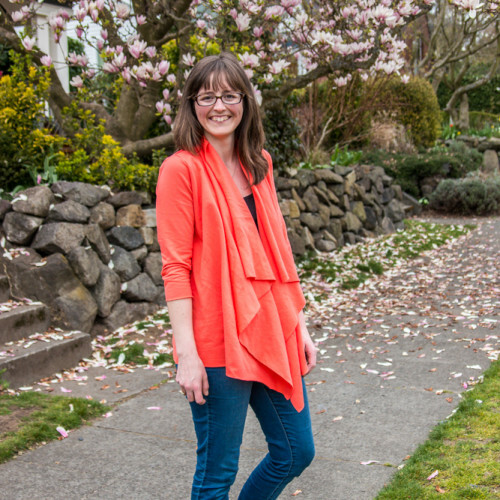 I love the ease of this cardi, and already have some knits that I can’t wait to sew into drapey cardigans! This is the one pattern that is most intimidating to me. JEANS! Jeans are hard enough to find when they are already made for you, but to try and make them, and also make them fit you as well as jeans are supposed to fit, yikes. That’s a little scary to me. NEVERTHELESS…they are on my list! Early in my Goat & Lulu days, I was sure that I would screw up a little ruffle bubble romper that I was dying to try, but I decided tried the pattern and made them anyway, and now I sell more of them than anything, and have perfected the pattern. I am hoping the jeans will be the same! Will my first pair be perfect? Probably not. But who knows? They could end up being my favorite pair! I have read a lot about this pattern, and have heard that it’s very user friendly, and outlines new techniques thoroughly and completely. SO, I accept my own challenge, and hope to make some awesome jeans!! Is this cute or what?! Quite a divergence from the jeans, this pattern is very simple, but makes a SUPER cute skirt! I love the idea of making a gingham one like above (navy and white? black and white? ), and definitely have plans to do a denim one. Maybe even a thin-wale corduroy?? The options are endless and will make a cute skirt to wear with button ups and sweaters and boots! There is nothing better than when a pattern comes with multiple versions, so that you can take that one pattern and make three completely different looks with it. I love that the Pearl Dress is a very simple shift style, but that with a few changes, you can have three different dresses! The Washi Dress is my very favorite dress to make for myself, of all the patterns I’ve tried. I made three over the summer, and I love each of them so, so much! I have a beautiful magenta Indian cotton print that I have been hoarding for months that I am planning on using for a long-sleeve Washi. SO excited for this one. I want (another) basic, knit dress in my closet that I can count on on those days that I wake up late, or those mornings where I just don’t have the energy to “put together an outfit.” I want to grab this dress and a scarf and go! And the Out and About dress will be the one! I have made a few of these in the past, and will be looking for a thick, stretchy knit that will keep the shape of the dress well. Maybe navy? Maybe red? Maybe a small pretty floral? Maybe all of them! I know the photo shows a shirt, but again, the wonderful thing about patterns is sometimes they include a shirt and a dress length!! I love the simplicity of the shape, and am obsessed with henley necklines (I have been buying them over and over and over). This will make for a very comfortable dress that will be easily layered all fall and winter long. LOVE this blouse! The breezy and loose fit and the perfect little short sleeves. I’ll be wearing short sleeves through October at least, so short sleeves is no big deal for fall! Plus, I can layer a cardi or jacket over it easily, or a nice big scarf. Another beautiful and simple top that can be worn over and over! I love this roomy tunic that will look so cute with skinny jeans and pants, and then equally cute with a cardigan later on. I am thinking a soft floral for this one. 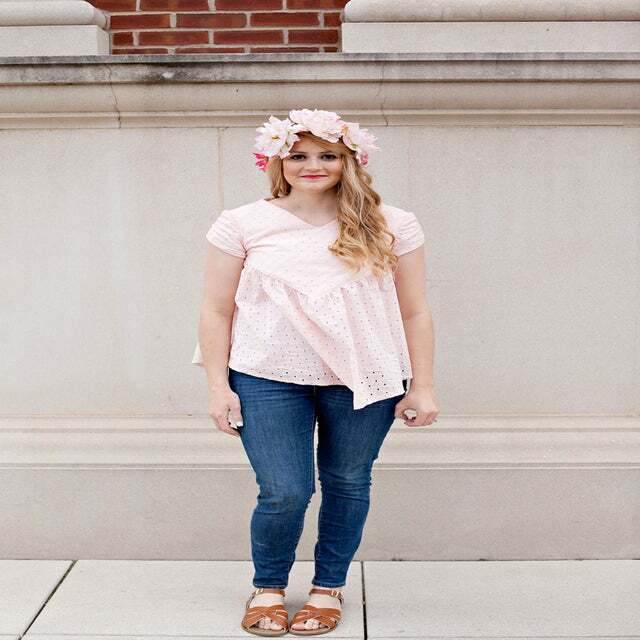 Who wouldn’t love the ruffle cap sleeves on this adorable top??! I need to make this asap, since I think a cardigan wouldn’t work over the ruffles on this top. Plus, it would hide the cutest part! And even better…there is a little girl’s version of this top too, so me and the girls could have matching handmade tops! And what’s better than that?! Evidently I just can’t pass up a good shift tunic top! 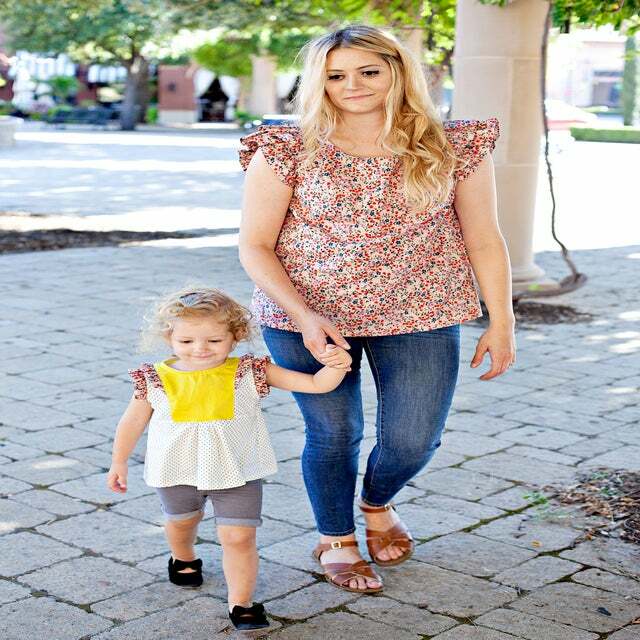 I just find them so versatile, since you can wear them loose alone with jeggings or layered with leggings and a sweater, you can belt them and add a blazer…there are just so many options. I love the welt pockets on this one, which will be another skill for me to champion. I figured I needed to add a few long sleeve options in too, ha. I think the Josephine Tunic is so special because of the beautiful little pintucks down the front of the tunic, which add so much sophistication, but are really simple to achieve. I love the idea of a print for this one, but I can also see wearing a solid black version over and over. Oh, CHOICES!! And to round out the group, a knit long sleeve top! 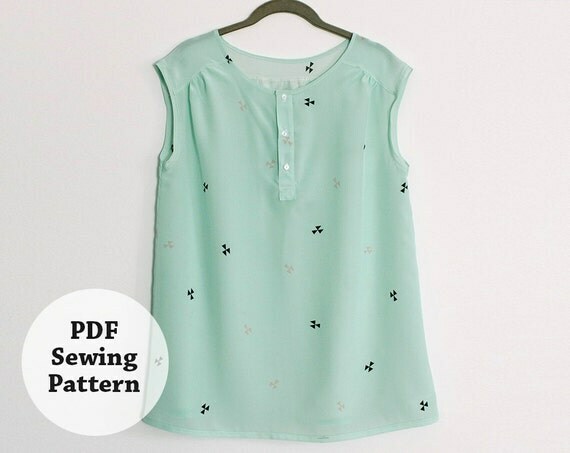 I think this peplum tee is so cute, and will be a little different from all the other loose tunics in the bunch. And that will do it! I think I’m going to be pretty busy!! I’ll keep you updated with my progress and follow me on Instagram (@amanda_goatandlulu) and #fallhandmadecloset for all the details and pictures! What are your favorites?? Let me know what you think!